‘No Problem’ or ‘You’re Welcome’? ‘No problem’. This catch phrase has not only caught on but has become a rampant virus! Last year at the Maine Innkeepers Association Annual Meeting & Conference the opening seminar speaker was principal and founder of Quality Management Services Judy Z. King. Creating guest loyalty was the topic. 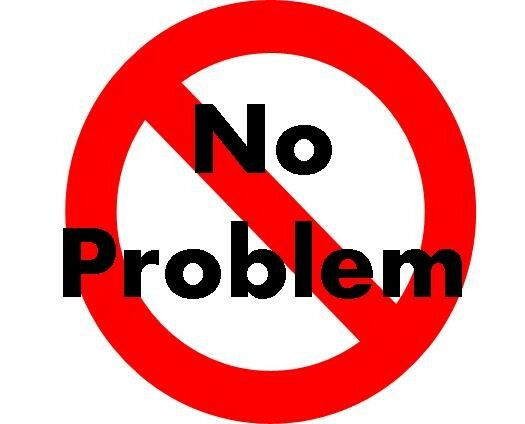 The part I recall over all were her comments on the use of the catch phrase ‘no problem’ used more and more often by people in the hospitality industry. Judy’s problem with ‘no problem’ is that it is a double negative that has replaced the positive ‘you’re welcome.’ That got my attention. For managers and staff that should be projecting a positive and caring service attitude, a double negative response to a guest’s ‘thank you’ is not a good response. This is true. The people that use this phrase are just repeating what they hear from others. It most likely came about because it sounds less formal than ‘you’re welcome’. Also the phrase sounds a bit hipper. I believe no one is intending to be rude when they respond with ‘no problem’. We were recently at a hotel where the entire staff (and I mean entire) responded with ‘my pleasure’. Now this response is definitely positive and a nice one to hear. But…it was used so often that after a while it didn’t sound sincere. The staff was obviously coached to the ‘nth’ degree to use this phrase. I personally would have liked a few ‘you’re welcomes’ mixed in. I learned as an innkeeper to end interactions with guests with; ‘is there anything else I can assist you with’ or ‘are there any other questions you have at this time’. This kind of interaction with the guest projects a caring attitude first but also gives the guest a feeling they can come to you with any questions or possible ‘problem’ at any time during their stay. I think I will stick with the welcome mat at the entrance and the ‘Thank you for staying with us’ as your guests depart. With the hopeful response of ‘you’re welcome, we had a lovely stay’. Triple positives! This entry was posted on Tuesday, August 25th, 2015 at 9:14 pm	and is filed under Operations. You can follow any responses to this entry through the RSS 2.0 feed. Both comments and pings are currently closed. Yeah. This is getting to be a real problem. I personally think it’s a problem with millennials but I might be wrong since I hear it from older folk, too. No doubt the phrase can be problematic. After all, as you pointed out, service to guests shouldn’t be a problem to begin with. I know “You’re welcome” would sound a lot nice and be more precise and correct. I’ve grown use to it, though, so I don’t have a problem with it…much. I am afraid I fall into that category described above by Bill. I have been known to take offense to the “no problem” response and often my dining partners look at me to make sure I am not going to respond negatively and remain polite to the server. My staff, though some do still use this phrase, know full well that I do not want to give our guests the impression that serving them is a problem and therefore we have instituted other phrases to substitute for “no problem”. Maybe we can influence others to treat our personal interactions as opportunities to express gratitude.